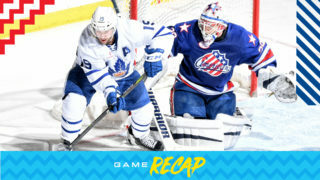 Adam Cracknell delivered the dagger against his former team as the Marlies downed the Rocket 2-1 in overtime for a second straight win and twelfth in a row over Laval, dating back to last season. It was a defensive duel that saw both teams kept off the scoreboard until the third period, with netminders Jeff Glass and Charlie Lindgren turning aside all the shots that came their way through the first 40 minutes. Colin Greening grabbed the game’s first goal at the 6:13 mark of the third, battling for the puck behind the net and jamming in a wraparound that squeaked over the line. JJ Piccinich and Jordan Subban had the helpers on the goal. With under four minutes remaining, Cale Fleury tied the game for the Rocket and sent it to overtime. Cracknell was the overtime hero as he skated off the sideboards, cut to the slot and fired a perfectly placed shot with just 49 seconds left in the extra frame. 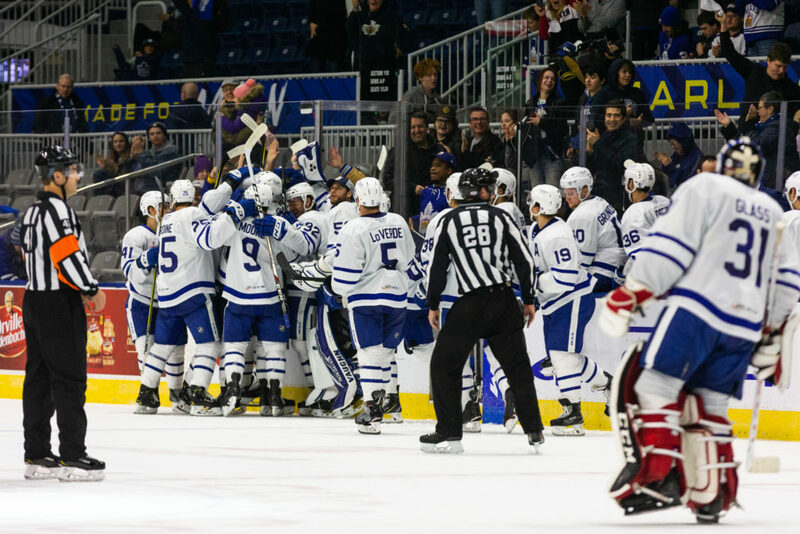 The win is the Marlies second in a row and they’ve now picked up at least a point in three consecutive games. Glass finished the night with 24 saves for his second consecutive victory while Lindgren stopped 20 in the losing effort. Greening’s goal was his first of the season as was Piccinich’s assist. 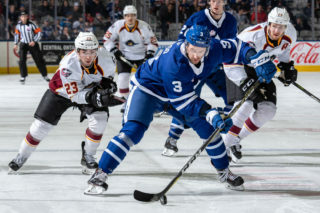 The Marlies are back in action Friday night when they host the Syracuse Crunch before setting off on the annual Royal road trip. Colin Greening scored his first goal of the season at 6:13 of the third period. Greening had 29 points (16 goals, 13 assists) in 73 games last season with the Marlies. Adam Cracknell scored the game winning goal at 4:17 of overtime. Cracknell has six points (2 goals, 4 assists) in eight games this season. This was Cracknell’s 700th professional game. J.J. Piccinich recorded the primary assist on Greening’s third period goal. This was Piccinich’s first AHL career point. Jordan Subban registered the secondary assist on Greening’s third period goal. Subban has five points (1 goal, 4 assists) in eight games this season. Jeff Glass stopped 24 of 25 shots. Glass is now 2-2-0-1 on the season with a .889 Save Percentage and a 3.28 Goals Against Average. Toronto went 3-for-3 on the penalty kill and 0-for-4 on the power play. Laval had a 25-22 edge in shots in all situations. 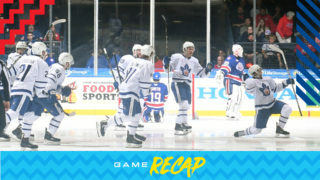 Andreas Borgman led the Marlies with four shots on goal. 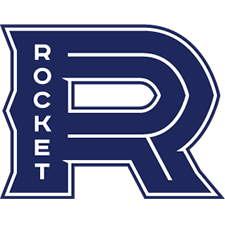 The Marlies are 2-4-0-1 against North Division opponents and 1-0-0-0 against the Laval Rocket. We are playing with a lot more purpose. We have spent a lot more time on that here in the last couple weeks. I think our guys have a better idea of what we expect from them and they’re executing. So, it’s been good to see and our defence are doing a lot better job at staying up and making the neutral zone a lot harder to get through and our forwards are helping them with their positioning and their work ethic as well. We are playing better as a group and that’s giving us the chance to win games. Well he’s just settling in and obviously, our team is playing better in front of him defensively (which) has really helped. He’s just making the saves and he’s looking calm and relaxed. He’s handling the puck very well. For both he and Kas, we made life fairly hard on them with how we performed early on defensively, so it was very tough to be a goaltender for our team, but we’re making life a little bit easier on them and they’re making the saves and giving us chances. We’re taking it a day at a time with him right now. He is healthy. The only thing with him is now, it’s been quite some time since he’s played a game. We want to make sure he’s ready and getting full practices and full reps and all those types of things. We expect him to be here in the near future. If it’s not going to be next game, then it surely will be the one after that. We’re just going to kind of see how the next couple days go and how he feels and how we feel. 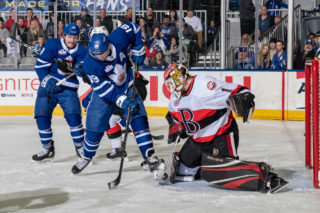 The Toronto Marlies (2-4-0-1) and Laval Rocket (3-4-0-0) will reignite their North Division rivalry Tuesday night when they face off for the first time this season. 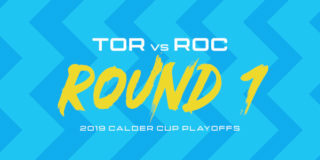 The Marlies are hoping to build off Saturday’s win over Hartford and take a second straight victory when the Rocket come to town. Entering the game, the Marlies have won 11 straight meetings against Laval dating back to last season. Carl Grundstrom will look to keep his hot streak going as the winger has picked up four points (2G, 2A) in his last two games. 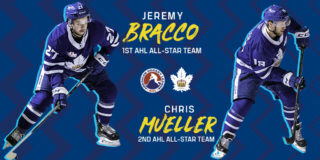 Trevor Moore (6G, 2A) and Sam Gagner (4G, 4A) lead the Marlies offensively entering the contest. The Rocket enter the game having lost two straight to Springfield. They are 1-1-0-0 on the road so far this season but have played on home ice for their five previous games. Kenny Agostino is averaging a point-per-game in the early going with 3G, 4A while Byron Froese, Michael McCarron, Alex Belzile and Brett Kulak each have five points on the year. Special teams presents an interesting matchup in tonight’s game as the Marlies have enjoyed early season success on the power play (23.3%) while Laval’s penalty kill has been stellar (90.0%). On the opposite side of things, the Marlies are looking to improve their penalty kill (76.7%) while Laval’s power play has struggled to get going this season (10.7%). Puck drop is set for 7:00 and fans can tune in to all the action on Leafs Nation Network and AHLTV. Follow us on Twitter and Instagram for updates and behind-the-scenes access from Coca-Cola Coliseum.